I was surprised to find they printed this as a full page. As it was a fairly short piece, they filled out the layout with the best pull quote ever. Some day soon, it will happen to you. You’ll be at a dinner party at a friend’s house, or Sunday supper at Mom’s. There’ll be a pregnant pause in the conversation. Coy looks. Someone will say, “Do you remember this?” And with a flourish, it’s there. The Thing From The Past. The Monster in the Box. The Skeleton In The Cupboard. Teapots that dribble. Pitchers that gush. Curly plates, leaden bowls, cups from Abstract Expressionist hell. 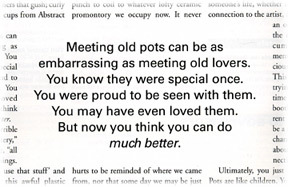 Meeting old pots can be as embarrassing as meeting old lovers. You know they were special once. You were proud to be seen with them. You may have even loved them. But now you think you can do so much better. I’m not sure it matters. The Horrible Museum of Your Pots is a historical collection. New acquisitions add to, rather than supplant older exhibits. They’re all still there, waiting for their place in the display rotation. “Oh God, I just want take it and drop it on the floor and say, ‘Oops, let me make you a new one,’” confides Tom. I know that temptation well. I’m only stopped by the sure and certain knowledge that if I do, on my next visit I’ll be confronted by Franken-pot, painstakingly reassembled with Krazy Glue and epoxy putty (possibly even gold leaf, depending on the sophistication of the conservator), a bolt through its figurative neck. Besides, breaking those old pots smacks of the worst of revisionist history. Embarrassing or not, they’re a fact. Part of our past. A record of our path from pinch to coil to whatever lofty ceramic promontory we occupy now. It never hurts to be reminded of where we came from, nor that someday we may be just as embarrassed by what we’re proud of today. Those who forget the past are condemned to repot it, right? That’s not to say that breaking pots is wrong. But do it in the now. Reexamine your standards from time to time, remembering that today’s not-quite-second could be tomorrow’s Ghost of Christmas Present Past. Engage the pot, and its owner. Because that piece of clay, embarrassing or not, has done something miraculous. It’s become a treasure, a special part of someone’s life, whether because of a connection to the artist, association with an occasion, or just the day-to-day accumulation of memories that precious things accrue. This is what we’re trying to do every time we set up our booth with our current best work. It’d be a shame to miss a chance to learn more about how that connection happens. Ultimately, you just have to let go. Pots are like children. You put your best efforts into making them perfect, but then one day they leave home. You may wince a little at their choices, but once they’re a part of someone else’s life, you can’t have them back. Hmm, he’s got a point. There was that thing I wrote about my sister’s wedding where I tried to be ee cummings… But I digress. Frank Gosar actually made two flat-rimmed cider jugs in his Wisconsin days. He currently lives and pots in Eugene, Oregon, and tells embarrassing family stories at www.offcenter.biz. Some years ago, a chance visit to a potter friend in Seattle resulted in a piece that was published as a Comment in the March 2006 Ceramics Monthly. It was pretty cool to be in print, especially since NCECA hit Portland in April that year, so I got recognized as a published writer at the CM booth. Just came across the original manuscript on my hard drive and thought I'd resurrect it here. I’d really expected to be a fly on the wall. After all, it wasn’t even my class. I was just visiting an old friend, formerly a potter in Israel, now living in Seattle and squeezing in clay time around the needs of parents, husband and two kids. Debby introduced me as a production potter from Eugene, and I went to sit quietly at the next wheel and sketch a little in my notebook. Practice. Lots. One of my early jobs was throwing for another studio, learning the craft at 75¢ a pot. It was an incentive to improve my proficiency and bring the price up to 90¢, and to improve my efficiency so that I could finish my week’s allotment by Wednesday, and have the rest of the time for my own work. We can’t all get paid while learning, but if you can figure out some incentive that works for you, I highly recommend it. Nothing improves skills like using them. Make what you love. Then find a market. It pains me to see young potters spending all their time second-guessing what will sell. The problem with finding the perfect product is that then you have to make it, by the hundreds, possibly thousands. Don’t make stuff you don’t like. Think of a better way. Is there a simpler way to make something? Would a specialized tool help? I keep a box of scraps of wood and wire and metal sheet, make ribs or templates on the fly. It’s amazing what you can do with a handsaw, snips, files or a bench grinder. Look at procedures that way too. Just because you learned something one way from your teacher doesn’t mean that’s the only way. I picked up a new trimming technique from Amy that night, but also thought of at least two ways to change it to work better for me. But don’t simplify it all away. One of the temptations of production is to pare away frills and details, to make things faster and easier to produce. This can be a trap leading to deadening sameness, pots with all the life removed. It’s okay to invest a little extra time and care on each piece, add a little ornament or detail or movement. Efficiency isn’t everything. New ideas come from everywhere. Attend workshops. Take classes. Teach classes--my students come up with questions I’d never have considered. Go to museums and galleries and read magazines, not just art magazines. One of the most amazing pottery pictures I’ve seen recently was actually a self-assembling lipo-polymer in Science News. Who woulda thunkit? Talk to your customers. I have friends who won’t touch commissions, but I’ve gotten some great ideas from taking them. Once again, anything that stretches your usual boundaries is a chance to grow. Leave time to experiment. Play around in your studio. Try things differently. Amy had a great assignment for her class: Instead of making ten identical pots for practice, try making ten different ones, all with the same purpose or function. Every year I throw a couple hundred bowls for our local Empty Bowls sale, and twice have changed my production soup bowls based on something I came across in those experiments. Ideas need time to grow. Make sure to provide some. If you’re not having fun, something’s wrong. I went back to graduate school in ceramics because I loved it. I still feel lucky to be making my living at it. If I wanted bleak, soul-destroying, repetitive work, I could have stayed in advertising. Frank Gosar quit advertising to study ceramics at the University of Oregon in 1985. His production pottery can be seen at www.offcenter.biz.